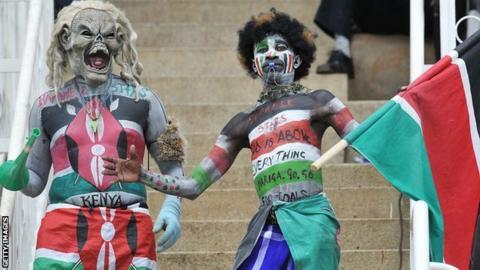 Kenya has confirmed its intention to bid to host the Africa Cup of Nations in 2019. The East Africans - who last qualified for the tournament in 2004 - have never staged the continent's biggest sporting event. They join newly-crowned African champions Nigeria, DR Congo, Liberia, Zambia and Algeria in the race to host the 2019 finals. DR Congo announced its plans to stage the event last week. The Kenyans are also bidding to play host to the 2015 African Youth Championships. "Kenya stands top in Africa as favourites to win these bids," Football Kenya Federation (FKF) chairman Sam Nyamweya said. "As a federation we are excited with the support of our parent ministry in this ambitious mission." The FKF plans to use two existing stadiums in the Kenyan capital Nairobi and to upgrade venues in the port cities of Mombasa and Kisumu. The Confederation of African Football (Caf) has yet to formally accept bids to host the 2019 finals but is expected to do so later this year. The next two Nations Cups' hosts have already been decided, with Morocco set to stage the 2015 finals and Libya organising the 2017 edition. The Libyans had originally been due to host this year's finals, before it was moved to South Africa following conflict in the North African country.